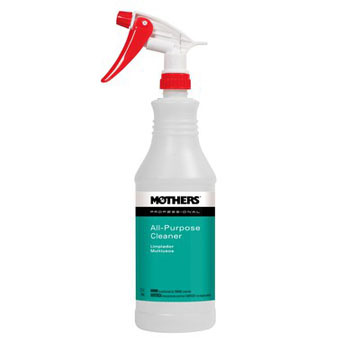 Mothers® All-Purpose Cleaner is a highly concentrated, biodegradable multi-purpose cleaning solution for a wide variety of surfaces. 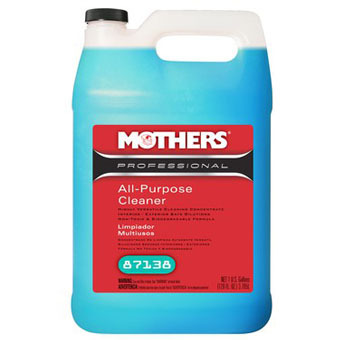 Combining highly effective cleaners with a combination of water miscible solvents and surfactants, this All-Purpose Cleaner breaks down dirt and grease with ease. Perfect for cleaning carpets, fabrics, vinyl upholstery, engine compartments, fender wells, door jambs and more. At higher concentrations, All-Purpose Cleaner is great for cleaning wheels, tires, whitewalls and pre-spotting carpets before shampooing. 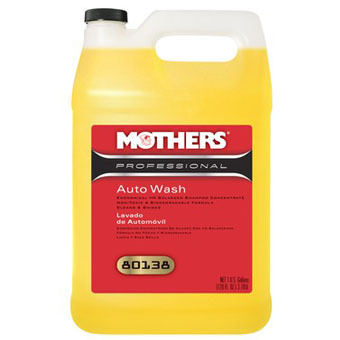 Mothers® Auto Wash is a carefully crafted concentration of soaps and detergents that cleans away grease and grime with ease. This pH balanced, non-toxic, environmentally friendly, and biodegradable formula will not streak paint or remove existing wax. Perfect for cars, trucks, airplanes, boats - virtually any vehicle. Great for do-it-yourselfers, detail shops, hand car washes or other premium wash facilities. an be used as a wet sanding solution when diluted 1/2 oz. per gallon of water. PROFESSIONAL AUTO WASH 1 GAL. 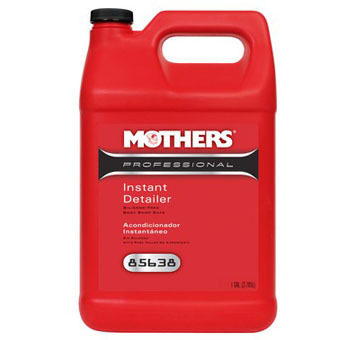 Mothers® Auto Wash is a carefully crafted concentration of soaps and detergents that cleans away grease and grime with ease. This pH balanced, non-toxic, environmentally friendly, and biodegradable formula will not streak paint or remove existing wax. 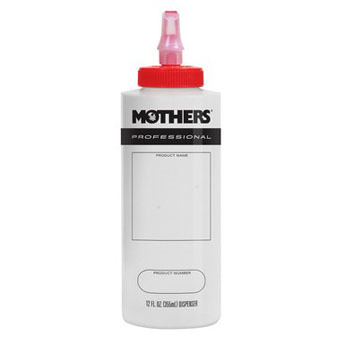 Dispense polishes and compounds with ease with Mothers® Professional Refillable Dispenser Bottle. It features a self-cleaning pop top to prevent clogging, keeping you focused on the task at hand, all while distributing the perfect amount of product every time. Buy in bulk, and dispense with ease with this high-quality dispenser bottle. 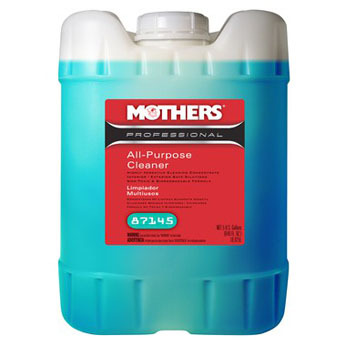 Mothers® Professional Paint Restoration System uses the same industry-proven formulas found in body shops worldwide to give you a showroom new finish, without the guesswork. Reconditioning your paint from normal wear and tear, buff fresh paint after color sanding, or even improve your factory applied paint finish, especially clearcoats. Finishing Polish removes compounding scratches, towel marks, hazing, holograms, and other imperfections. 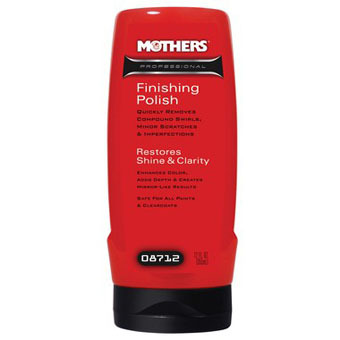 Designed for the professional detailer, but simple enough for anyone, Mothers® streamlines paint correction to give you brilliant color, enhanced gloss, unmatched depth, and a perfectly prepared surface, ready for waxing. 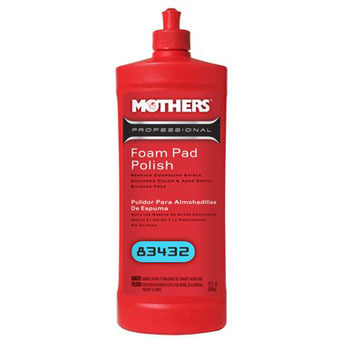 Mothers® Professional Foam Pad Polish is recommended for removal of compounding swirl marks from all types of refinish or factory applied automotive paints. Also recommended to enhance color and add depth. Mothers® Professional Glass Cleaner is a cost-effective and versatile cleaning concentrate formulated for all glass and virtually any surface. Ideal for use in high volume detail shops and car washes to remove tough grime, dirt, oily film and fingerprints. Also great around the house, car, boat or motor home, even on tinted window surfaces. It dries quickly and leaves behind a sparkling clean, streak-free shine, even in cold weather. Mothers® Professional Hand Glaze is recommended for added shine and protection and may be used after Mothers® Professional Foam Pad Polish to achieve unparalleled depth and clarity. Hand Glaze is easy-to-use and completely safe on all types of paints. 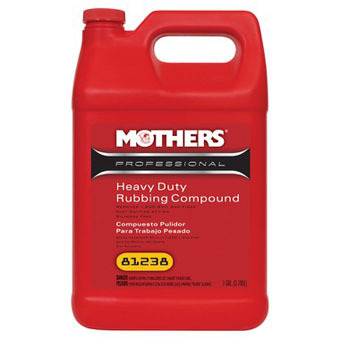 Mothers® Professional Heavy Duty Rubbing Compound quickly removes 1,200 grade and finer sand scratches from all types of refinish and factory applied automotive paints. May also be used to remove heavy oxidation, car wash scratches and other defects from paints that do not require sanding. 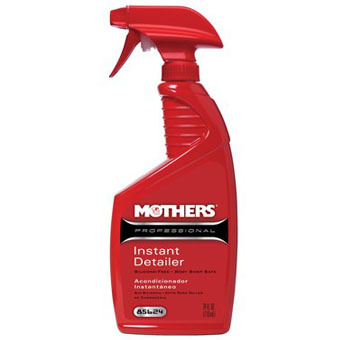 Mothers® Professional Instant Detailer is a silicone-free, body shop safe, paintable product that provides unparalleled depth and clarity. This unique formula is easy-to-use and completely safe on all types of paints, including clearcoats. Simply the fastest way to prep and shine any vehicle’s paint in any body shop environment. Mothers® Professional Machine Glaze is a high-quality polishing glaze that quickly removes compound haze, fine scratches and swirl marks from all types of refinish or factory applied automotive paints. 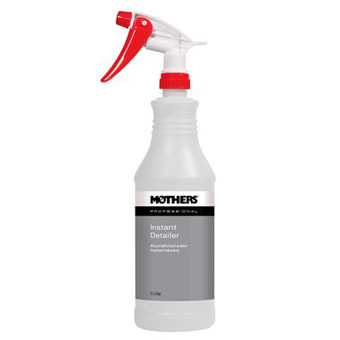 Mothers® Professional Paint Restoration System uses the same industry-proven formulas found in body shops worldwide to give you a showroom new finish, without the guesswork. Reconditioning your paint from normal wear and tear, buff fresh paint after color sanding, or even improve your factory applied paint finish, especially clearcoats. Rubbing Compound works with your favorite buffer to quickly cut through water spots, and effortlessly remove heavy oxidation, car wash scratches and other defects. 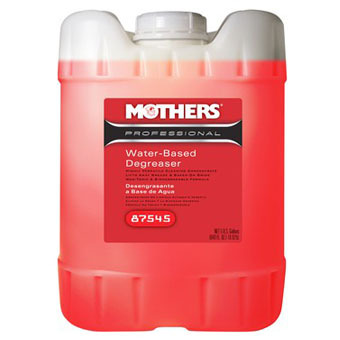 Designed for the professional detailer, but simple enough for anyone, Mothers® streamlines paint correction to give you brilliant color, enhanced gloss, unmatched depth, and a perfectly prepared surface, ready for waxing. Mothers® Professional Rubbing Compound quickly removes 1,500 grade and finer sand scratches from all types of refinish and factory applied automotive paints. May also be used to remove light oxidation, car wash scratches and other defects from paints that do not require sanding. Mothers® Silicone-Free Dressing Concentrate is a pre-delivery prep product designed specifically for body shops. This silicone-free and water-based formula can safely be used on any rubber and trim. 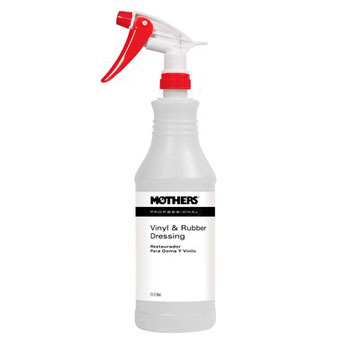 Mothers® Vinyl & Rubber Dressing is extremely versatile, and can be used on all vinyl, rubber and plastic surfaces, even engine compartments. Protects all these surfaces from the elements, and leaves a non-greasy, “like new” finish that will not attract dust. This white silicone emulsion features a thick, creamy consistency that is easily sprayed or wiped onto any surface, and dries to a medium-high shine. Does not contain soaps, glycerin or other extenders. Mothers® Water-Based Degreaser features a safe but effective blend of grease cutting surfactants and biodegradable solvents which lift away carbon and baked-on grime from a variety of surfaces. This non-toxic, super-concentrate is tough on tenacious filth, but will not stain paint or harm aluminum engine components.